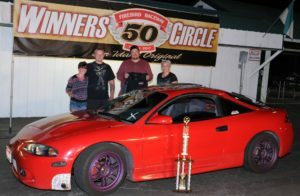 We hosted the fourth stop in the six-race Fairly Reliable Bob’s Club Challenge Series on Friday, July 7. Then Saturday, July 8, the 16th Annual NAPA Auto Parts Import Summer Jam showcased the sport compact fraternity. Both nights featured blistering hot heat. But thanks to everyone for supporting our two Summer-time events. Jim Coryat, Rock-It Racing, .055 reaction time, 10.18 (10.17 dial) 123.91 def. Alex Smith, Kuna Knuckle Draggers, .078, 10.55 (10.58 dial) 128.40. Richard Lally, The Barons, .046, 11.94 (11.84 dial) 96.55 def. Debbie Phillips, Naughty Girls, 14.67 (11.60 dial) 59.70 (fuel pump issues). Jeff Bell, Melba Outlaws, .071, 14.11 (14.07 dial) 92.67 def. Catherine Seamons, Kuna Knuckle Draggers, .071, 13.30 (13.25 dial) 103.38. Stephanie Marsala, The Barons, .088, 14.35 (14.30 dial) 98.12 def. Bob Day, The Barons, -.210 foul, 13.89 (13.93 dial) 105.12. Jan Shawver, Down N Dirty, .090, 17.34 (17.45 dial) 83.43 def. Raymond Lee, -.063 foul, 15.58 (15.51 dial) 89.55. Robert Jesse, Twin Falls, .343, 11.90, 124.55 def. Jake Montgomery, Nampa, .112, broke 100’ into run. Jake Rick, Caldwell, .023, 13.14 (12.90 dial) 86.91 def. Nicholas Rayl, Baker City, Ore., .167, 14.15 (13.90 dial) 102.28. Alex Chavez, Meridian, .227, 14.43 (14.50 dial) 98.85 def. Rich Pedraza, Boise, .209, 15.45 (15.55 dial) 81.14. Scott Grondahl, Nampa, .120, 10.40 (10.17 dial) 128.10 def. Ryan DuBois, Boise, .042, 11.49 (11.15 dial) 131.41. Joseph Johnson, Caldwell, .085, 14.67 (14.57 dail0 90.97 def. Vince Dinh, Boise, -.133 foul, 13.21 (12.85 dial) 112.29.